A surprise thundershower Nov. 15 reminded Pattaya residents of the flooding and had traffic backed up. PATTAYA – Mother Nature is ensuring that rainy season may be gone, but not forgotten. 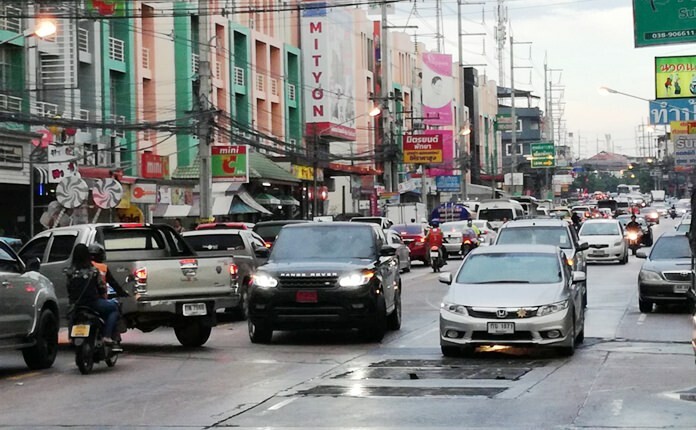 A surprise thundershower Nov. 15 reminded Pattaya residents of the flooding that had been common during the summer months, with traffic backed up for kilometers along Thepprasit Road as runoff inundated the southern end of Sukhumvit Road. The flooding cleared within 30 minutes, however. The city is working to prevent flooding as civil servants go around clearing out canals, digging up drainage tunnels and so forth. So far, the floods are not as bad as last year, based the time to drain.